I have one side of my card dedicated to my logo. Why? Because I think of it as the front door to my office. It’s the ‘welcome’ to my card. It helps with brand identity and instills confidence so give your logo the space it deserves. Make it as big as possible and ensure nothing interrupts it. By this I mean, avoid putting other information too close or putting pictures or watermarks behind it. Why not download my FREE ‘Business Card Info Sheet’ which accompanies this blog? Whatever you choose to include, ensure that your preferred method of contact is highlighted. So if you prefer to be contacted on your mobile, perhaps, make it bold and a little larger than the landline. 4. Title – which is being left off more and more with the fear of appearing pretentious, personally, I like to know whom I’m dealing with. 5. Web address – to save space, omit the www. You don’t need to type this in anymore and if it has a .co.uk or .com after it, people will know it’s a web address. If you work from home you may want to leave this out and just put, “Pride Park, Derby”. I think it is important for people to know where you’re based or where you can operate. Don’t assume that people can guess what you do from just reading your company name. Having a company name like, “Essential Print Services’ is probably an easy one but if your company name is abbreviated or not obvious, then spell it out for people. Perhaps include 2-3 short bullet points about your services or list your top three products. With methods of communication like faxes becoming pretty much obsolete, including your social media icons will show your prospects that your company is keeping up with the times. People can just do a search for you on their favourite social media network. However, if you want business people to link up with your business profile rather than your personal profile, then include the address you want them to see. Don’t make the mistake I made. I used to include just the social media icons on my literature. So when people searched, they would search for me, Yvonne Gorman and not my company, Essential Print Services. 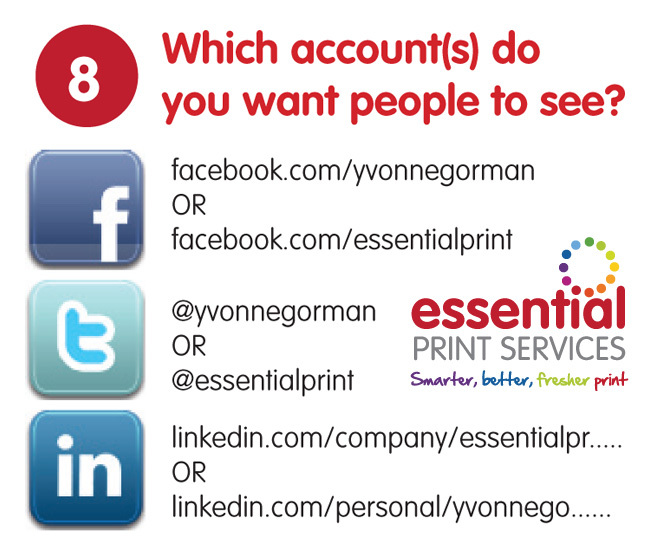 On Twitter for example, people are following @yvonnegorman rather than @essentialprint, which is fine (sort of) because people buy from people, but I sometimes tweet and post things about my personal life, which is not always relevant to my business contacts. I may not want my biggest and best client to know what I got up to at the weekend! If you do include social media icons, ensure the files you use are the most recent versions and are print-quality, otherwise, you may end up with a mix-match of blurry icons. If in doubt, just email me and I will check them for you. If you’re feeling really brave, then include your picture. I’m not talking about the ones with you in your swimming trunks or bikini! Something more professional. Why? Because people buy from people. When I send information by post to people I haven’t met before, having my picture on my business card is a real ice breaker. The recipient is reminded that a human being has sent it to them and people will feel more familiar with you when you make that follow up call. If you’ve met someone once at a networking event and they don’t look at your card again for a few weeks, if you have your picture on your card, they’re more likely to remember you. 11. Accreditations & Industry Bodies . If you are a member of a business group, like Derby Hub, or if you have industry accreditations, you may want to include these on your card. They will add gravitas to your business card but first ask yourself, “will they give your card a shelf life?” “Will your card have adequate space.” If you decide to leave one of the groups, or one of the organisations goes out of business, your business card is no longer valid. Why not download my FREE ‘Business Card Info Sheet‘ which accompanies this blog? It works well. It makes a great first impression. It is as though I’m presenting the card as a gift rather than just a throw away item, which adds value. If you colour co-ordinate the envelope to your logo, it looks like a well thought through gesture and shows your contact you have attention to detail. Or what about colour co-ordinating the envelope to your client’s logo or favourite colour? Or to a piece of clothing they are wearing? I always carry a stock of pre-printed multi-coloured envelopes. That way, when I meet someone, I ask, “what’s your favourite colour?” and hand them a card in an envelope of their choice. If envelopes are not your thing, then think about how you are going to present your card? The Japanese present their cards with two hands and take time to look at cards they receive as a mark of respect. This may seem odd to us, but what a lovely gesture? After all, you’ve spent the time and money putting it together, why not give it the recognition it deserves? Why not invest in a nice business card holder? Again, choosing one that is a little different or co-ordinates with your logo and brand will make your cards memorable. You could buy a silver business card holder and ask a local trophy company to engrave your logo on it. But after all this…you must stick to what you feel comfortable with. You have to feel confident giving out your cards. If you don’t feel proud to hand out your card, then talk to someone like me. I can provide you with some Business Card Coaching. Use both sides of the card; this valuable space is often neglected. Some would argue that this area can be used to make notes on but with iPhones and Blackberries, few people bother scribbling down notes. Standard size: 85mm x 55mm. Sticking to this size will ensure your business cards will fit in most business card wallets and holders. The standard weight of board used for business cards is between 350gsm-400gsm (gsm = grams per square metre). Just because a board is 400gsm, doesn’t mean it is going to be thicker than 350gsm. Some 400gsm boards can be thinner than 350gsm and every type of board is different so ensure you obtain a sample before purchasing. d) Make your card useful. I’ve seen a photographer’s business card double up as a free standing mini calendar and each month they would send people their new card, with new pictures and message. It is a great way to stay in touch with your clients and to have your company’s brand on your clients’ desks…and the best bit; cost effective advertising all year round. As the old saying goes, ‘you’ll never get a second chance to make a first impression’ so good quality business cards are essential for anyone in business, that means business. Business Cards are one of our best sellers and so we know what works well. To help you make the right impression; every card that is printed by Essential Print Services is printed onto quality, heavyweight board. Matt lamination, which we highly recommend, will make them even more durable. But there are a whole range of boards and finishes that you can choose from and using my years of experience I will help you decide on the most efficient and cost effective choices, which will help your company to really stand out from the crowd. f) The Scouts are right; be prepared. Always carry business cards with you. To the pub, on holiday, everywhere. You just never know where that next opportunity will spring up. If you can help someone and you need to give them your details, what better way than to give them your business card. No doubt, in time, the favour will be returned. So make a fabulous first impression. 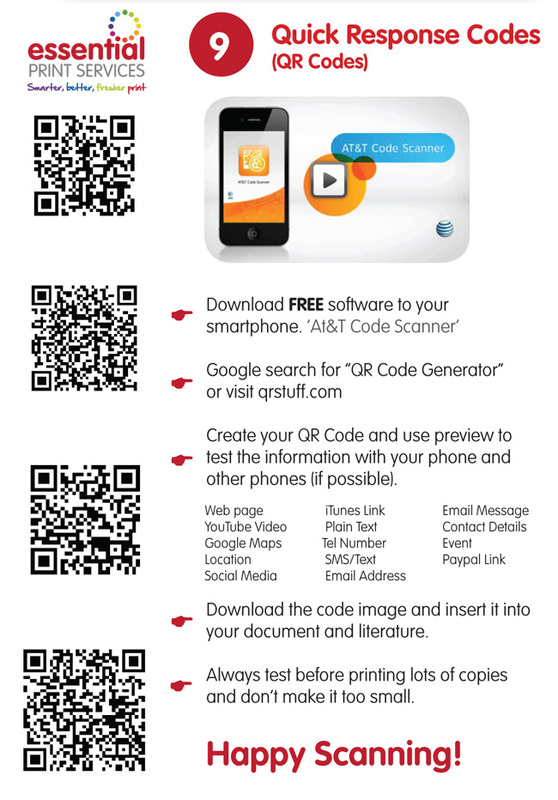 Business cards are quite often the first piece of literature a new person will receive from your business. What would it say about your business if you handed over a sub-standard business card, dog-earred, marked and crinkled? If you can give your business cards due care and attention, a potential customer will have more confidence in you. Remember; when your card is amongst all those other cards, a business card that carries a little more information and innovation has more of a chance of being noticed. And whose card would you like to get noticed? Your business card, or your competitors’? 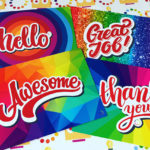 When someone chooses Essential Print Services to print their business cards, I talk them through all the best options and ensure they’re happy and clear about what we will be doing for them. I have no choice but to do it this way – it is my reputation on the line. I want to provide the best service, the best prices and to ensure the business cards I print for my clients will work hard for their company. 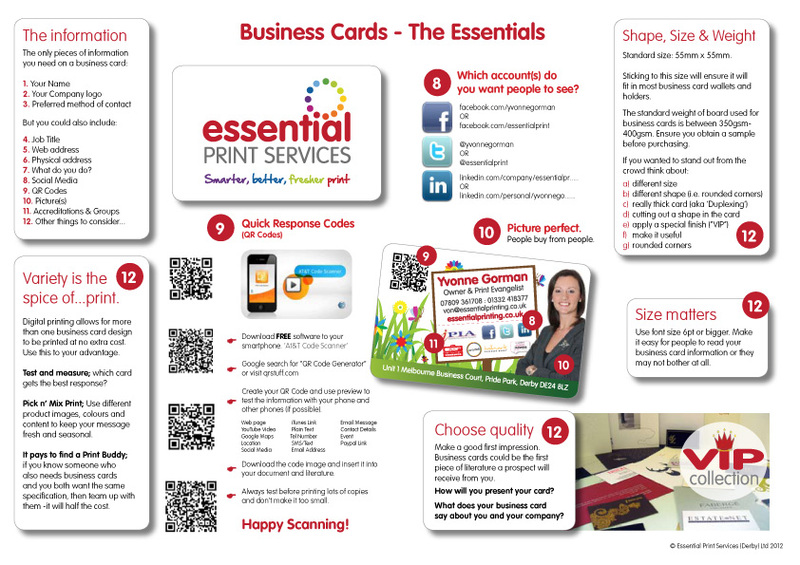 For impartial advice about business cards or any other form of printing, call me, Yvonne, owner of Essential Print Services on 01332 418377. I look forward to hearing from you soon.